Omaha Hi – Lo – sometimes called Omaha 8 or better – is an increasingly popular poker variation. At showdown the pot is split between the best high hand and best low hand. High hands follow the standard poker hand rankings while the low is made of the lowest 5 different cards but are limited to cards which are 8 or lower. It is therefore possible for several players with 4 hole cards to be chasing different high and low combinations after the flop. There are many myths associated with pot Limit Omaha high low, and were going to look at 4 of the biggest misunderstandings about Hi Lo and the ones that if you believe them will lose you money over the long term and harm your enjoyment of this fun poker game. 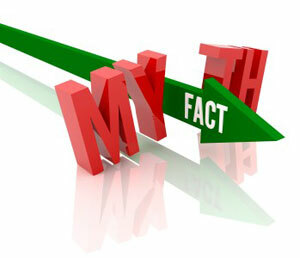 Myth #1 – Omaha Hi Lo is a very Complicated Game. Sure the different hand combinations from 2 of your 4 hole cards and 3 cards from the board make the game feel complex for the beginner. However after the initial learning curve then most players settle down and understand the game very well. Or you win the high side of the pot and there is no qualifying low hand held by any player – in this situation the whole pot is awarded to the high hand. While the game does have some complexities the rules are actually very simple. The 2 from your hand and 3 from the board for each of the high and low combinations can use the either the same cards or different ones. You do not have to know the odds and outs for every possible combination – simply look for the nuts (best possible hand) for each of the high and low hands and compare this to your current holding. This myth arises due to the flexibility of an Ace card, which can be used as the highest card as in 10-J-Q-K-Ace in your high hands and also as the lowest card as in Ace-2-3-4-5 in your low hand. While this is a good rule of thumb for beginners you will find yourself losing much value from low hands such as 2-3-5-K by following this rule. The problem with only playing hands with aces is that an ace will hit the board fairly often – this may give an opponent with the other low cards the winning low. At the same time your pair of aces will not often win the high side of the pot without some kind of improvement. The starting hand requirements in Pot Limit Omaha Hi Lo are important, but folding every hand not containing an ace will soon leave you wishing you had entered that pot! People think that because the pot is separated into two, one for the high hand and one for the low hand, that they must also play hands that can compete for both pots. So when they get dealt a hand that can only compete for the high pot such as K-K-J-10 they think it will only lose you money and should be folded pre-flop. The fact is that 30% of the time, that’s 1 in every 3 hands, there will be no low hand possible on the board, remember you HAVE to use 3 cards from the board, so there must be 3 cards lower than 8 on the board to allow a low hand to be possible. In this situation the whole pot is awarded to the high hand. So good “High Only” hands like K-K-J-10 should not be discarded as they will often be playing for the entire pot rather than just half of it and do have some value. The relatively small bet sizes pre-flop mean that for a small investment you can speculate and possibly scoop a large pot later. The best time to play high-only hands is from late position at the table where there is less chance of a big raise from a player behind you. Being “quartered” in Pot Limit Omaha Hi Lo usually happens when you share the low half of the pot with another opponent while someone else takes the high side. This means that you are only getting back half of all the bets you invested in that pot – in other words you have lost money, a negative return. The myth here is that it is difficult to spot such situations in advance and that this is a ‘hazard of the game’. In Hi Lo, your opponents are likely to favour low cards pre-flop. This means that on any low flop you need to have some backup to avoid being counterfeited. Just because you have the best low hand on the flop, doesn’t mean the next cards to come won’t change that. As long as you are aware of that and control the size of the pot accordingly you can avoid being quartered. For example – you hold A-2-9-K and the flop comes 3-6-8, you hold the nut low at this point – but the likelihood is that one of your opponents holds the same. Here you need to control the size of the pot and even consider folding if the action bets too heavy in front of you. In addition to only having a quarter-pot stake in this hand you have no way of making a high hand and an ace or 2 on the turn or river could actually counterfeit your hand and give you only the second best low. Now that you have see the real picture behind these 4 Common Omaha Hi Lo Myths, you should be able to see the facts more clearly and enjoy your Omaha session. Hopefully it will also save you making small mistakes that over time, can cost you a lot of money.